Prime the lids and highlight the brow bone and inner corners with a champagne shade. 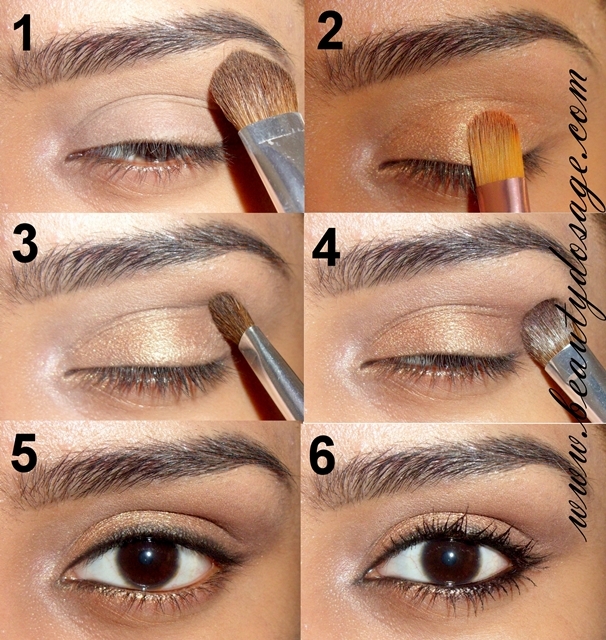 Apply a gold shade all over the lids and also the inner part of the lower lash line. I have foiled the shadow to make it look more vibrant than how it is by itself. Using a medium brown shade, sweep it in the crease while blending the harsh edges from the gold shadow. Lend up to the brow bone highlight. Using a darker brown, concentrate it on the crease and blend away. The reason why I used two shades of brown is to give a gradient. Apply a thin line of kohl on the upper lash line and smoke it with a smudge brush or crease brush. As you can see in Eva’s picture, the inner part of her upper lash line is smoked while the outer part is with a harsh black liner. Line the lower lash line with black kohl and add on mascara. Concentrate the mascara more toward the inner part as the lashes will be used only on the outer part. If you look close at her eyes, you can see that the lashes are extra long and thick at the end only. This is achieved through accent lashes. Accent lashes are basically lashes for the outer half of your lashes. This is sold separately but you can also cut you normal lashes in half and use them. Make sure you go over the lash line with liquid liner after you apply lashes. Once you apply and glue is dried, curl you natural lashes with the fake ones to lend them. Tight line your eyes so that the beginning and end of the lash and isn’t visible. Such a gorgeous makeup look. This is perfect. Amazing tutorial! Loved it Jeeshan. So pretty! Thanks for visiting my blog! I will follow you on bloglovin' so I hope you do the same!